Just looking for brief events and their dates? Click here. The history of the Buffalo Bill Center of the West (formerly the Buffalo Bill Historical Center) starts with Mary Jester Allen, who had a dream. 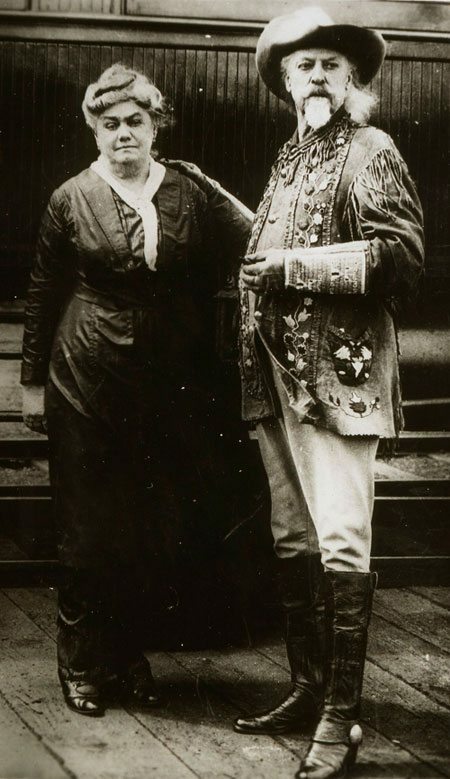 After her famous uncle died in 1917, she envisioned a great national shrine and memorial to both William F. “Buffalo Bill” Cody and the early pioneers of the American West. 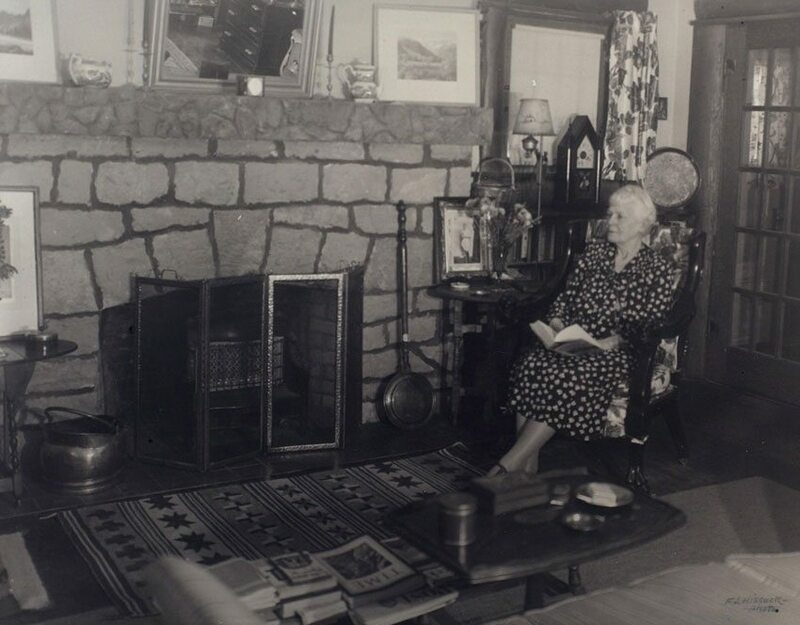 In 1927, she began her quest as curator of the Buffalo Bill Museum, a modest log building in remote Cody, Wyoming, mimicking Buffalo Bill’s TE Ranch house, on the Southfork of the Shoshone River. The story of the evolution from a 50 x 70 foot log building to the monumental Buffalo Bill Historical Center is fascinating and inspiring. It is a tale of vision, perseverance, and dedication, Eastern and local support, creativity and continuity. Today’s Center encompasses five museums, a research library, a professionally developed Web site, and a vibrant educational outreach program. William F. “Buffalo Bill” Cody loved the limelight, high drama and adventure, travel and change, challenge and complexity. He became a world-renowned showman, depicting the American West in staged events that riveted attention and captured hearts worldwide. The genesis and development of the Buffalo Bill Historical Center has, historically, placed him at center stage. Without question, were it not for his life and fame, this institution would never have come into being. The first seeds of an idea for a memorial to Buffalo Bill were planted in early 1917, shortly after he died. However, it would take seven more years for a bronze monument to be conceived and dedicated in his hometown of Cody, Wyoming, and ten more years for construction of the Buffalo Bill Museum, the first, lone museum of what was to become the Historical Center. This delay was due, undoubtedly, to the entrance of the U.S. into World War I in 1917, which changed the town’s and the country’s focus for a time. 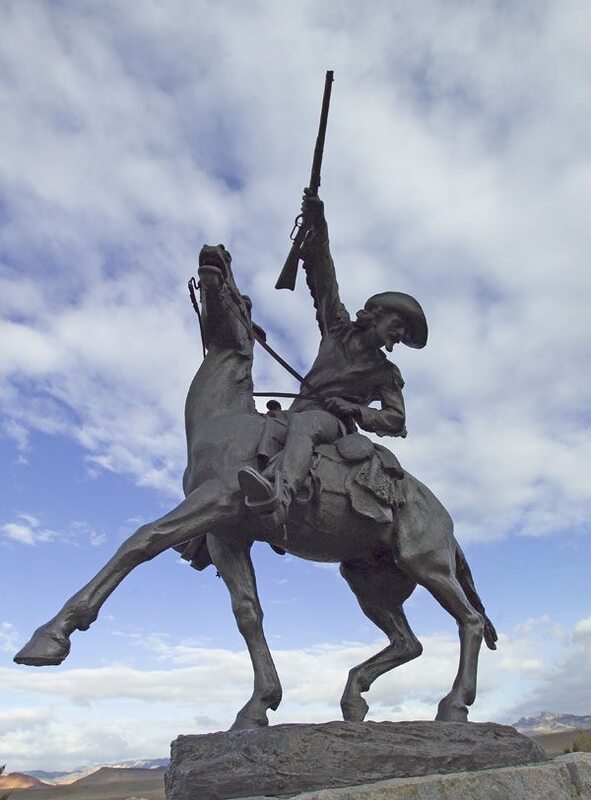 Once built, however, the Buffalo Bill Museum served as a memorial, alongside Gertrude Vanderbilt Whitney’s enchanting bronze monument, titled Buffalo Bill—The Scout, for more than thirty years before construction of a second museum. These museums and other later developments owe their origins and continued vitality to William F. “Buffalo Bill” Cody and to those who fought to keep his memory alive throughout the years. Historically entwined with the town of Cody are the Buffalo Bill Memorial Association, the original Buffalo Bill Museum, and, now, the massive complex of five museums and a research library that form the modern Buffalo Bill Historical Center. 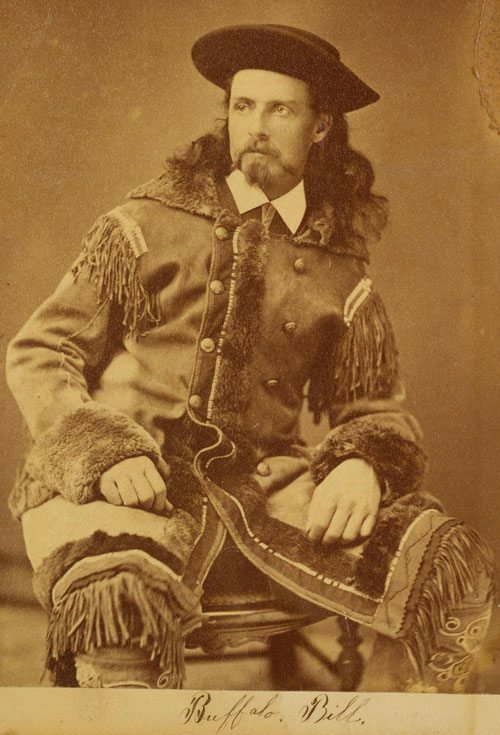 Born in 1846 in Scott County, Iowa, Buffalo Bill was an icon in the history of the American West. His Wild West shows became known throughout the world and his zest for exploring and adventuring led him to experiences as a bullwhacker, a mounted messenger, a trapper, a prospector for gold, and a Pony Express rider—all by the age of 15. He also served eighteen months in the Civil War as a scout for the 7th Kansas Cavalry. After the war, Cody briefly operated a hotel, drove a stage, and hunted buffalo for the railroad. His abilities as a buffalo hunter earned him the nickname “Buffalo Bill” in 1867. After this stint as a buffalo hunter, he became a renowned prairie scout, earning him a Medal of Honor in 1872. In 1883, Cody created Buffalo Bill’s Wild West, propelling him to even greater fame and fortune. He was instrumental in settling the Big Horn Basin of Wyoming. In 1896, he and six other men founded the town of Cody (see our biography of Buffalo Bill). The Wyoming Legislature had appropriated $5,000 during its 1917 Legislative Session, and only about a month later, the Certificate of Incorporation for the Buffalo Bill Memorial Association was signed. The money was “…to be used in connection with such contributions as may be made to the fund hereby appropriated for the purpose of obtaining designs for and erecting a fit and proper memorial statue of William F. Cody deceased, to be erected at or near the town of Cody.” The town’s memorializing and grief would soon turn to anger and shock, however, when it was announced that Buffalo Bill was to be buried on top of Lookout Mountain west of Denver, with the burial to take place the following summer. Cody residents were not prepared to do battle, and sat by, helplessly, as the remains of their town’s founder were interred 500 miles away. Cody had become ill and died while visiting his sister May (Mary Hannah Cody Decker), in Denver. His wife, Louisa or “Lulu” went there to retrieve the body and to bring his remains back to Cody. However, a rumor has long persisted that the publisher of The Denver Post (Harry Tammen) and other powerful Denverites, such as Frederick Bonfils, persuaded her to bury Cody instead on Lookout Mountain, offering her a rather large sum of money to do so. No concrete proof of this has ever surfaced, and it remains speculative. It is known that Tammen gave Buffalo Bill a $10,000 funeral, a rather expensive cortege for that day and not something that Cody, Wyoming could afford.